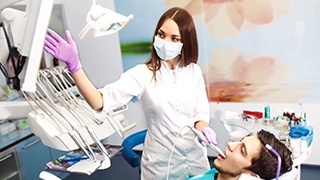 Sedation dentistry is an effective treatment option to help many patients achieve and maintain complete comfort throughout their time in our office. At Ridgepointe Dental, Austin Amos, DDS, JD, is happy to provide mild, effective nitrous oxide sedation to help patients of all ages receive the pain and stress free dental care experience that they deserve. 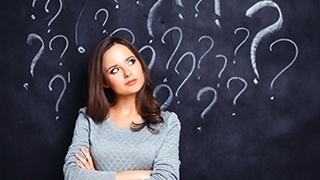 If you’re interested in learning more about our sedation dentistry services, contact your dentist and team in The Colony or keep reading to get answers to some of our frequently asked questions. Dr. Amos and the Ridgepointe Dental team look forward to delivering safe, comfortable dentistry services that will exceed your highest expectations. What Type of Dental Sedation do You Provide? At Ridgepointe Dental, we provide nitrous oxide sedation. This is one of the longest used forms of dental sedative. 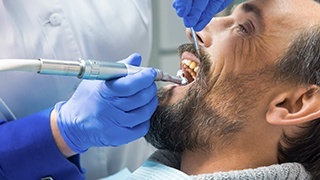 For more than a century, dentists and other medical professionals have relied on nitrous oxide, sometimes referred to as laughing gas, to deliver even the most complex treatments while patients maintain the optimal level of comfort. It is such a popular option because nitrous oxide offers easily adjusted dosage, so every patient stays completely relaxed and free from pain throughout treatment no matter how long it takes. Nitrous oxide is a gas inhaled through the nose. Throughout treatment, the dentist can monitor your response to this sedative and quickly adjust your dosage to ensure you maintain complete relaxation. 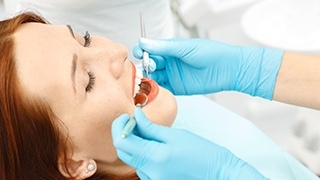 Once the nitrous oxide mixture is removed, you will begin to feel immediately better. In just about half an hour at most, patients are completely back to their regular function and can return to their daily routine. Do I Have to Take off Work? Thanks to the fact that the effects of nitrous oxide wear away as quickly as they set in, most patients don’t have to worry about missing an entire day of work, school, or any other regular activities as is necessary for those patients who use more advanced oral conscious or IV sedative treatment options. Additionally, you can drive yourself to and from our office, so there’s no need to rely on anyone else for transportation. In short, nitrous oxide sedation is the effective and convenient choice for patients who want to stay relaxed throughout their dental appointment without missing out on their regular day-to-day routine. To ensure comfort for patients with sensitive teeth, gums, or gag reflexes. To help patients with severe dental phobia or anxiety receive the care they need without unnecessary stress. To allow patients to receive numerous or complex treatments in fewer appointments with minimal discomfort. To protect young patients and those who may not be able to understand their treatments, so they can safely receive the care they deserve. To keep patients with physical impairments or chronic pain comfortable throughout their time in the office.